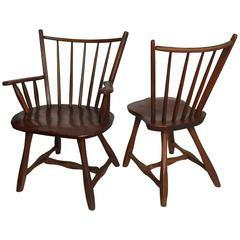 Made entirely of thick quarter-sawn oak, these little beauties are both sculptural and functional. 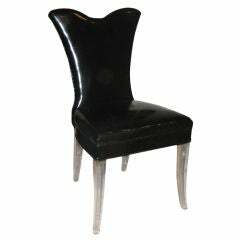 Beautifully rounded seats; lovely cutouts on the backrest and front foot. 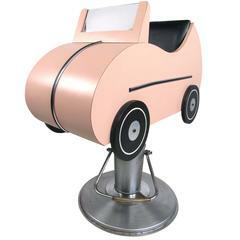 The seat is dining chair height, but the backrest is very low. Very good original. Great color. 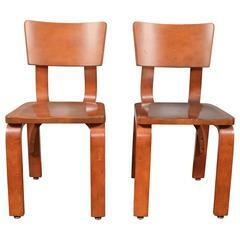 Charming pair of sculpted Mid-Century chairs by Thonet. Marked with partial sticker remnant to underside [Thonet Park Avenue]. 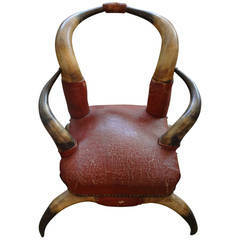 Great children's or child's chair of horn with distressed leather upholstery and brass nailhead trim.